Beginning the 1st of January 2017, federal workplaces have been required to label hazardous chemicals that are consistent with the Globally Harmonized System of Classification and Labelling of Chemicals (GHS) under the Work Health and Safety (WHS) legislation. The GHS is a system for standardising and harmonising the classification and labelling of chemicals, which was developed by an international team of hazard communication experts appointed by the UN. The goal of the GHS is to provide readily available information on the hazardous properties of chemicals as well as recommended control measures. With the GHS in place, the safe production, transport, use, and disposal of said chemicals become more manageable, resulting in the protection of humans and the environment. With the help of the GHS, chemical hazards are more easily identified by and communicated to those who are potentially exposed, such as workers, transport workers, emergency responders, and consumers. The Australian Dangerous Goods (ADG) Code is only applicable to the transport of dangerous goods via road and rail. For instance, the ADG Codes require specific signages on trucks or trains bearing the dangerous goods, as well as at the entrance to the storage facility. It provides information that pertains to managing immediate hazards during transport, such as emergency situations. On the other hand, the WHS Regulations for GHS labelling provide information regarding the use, handling, and storage of hazardous chemicals at the workplace. The implementation of the GHS not only improves the quality of the information regarding hazards in the workplace, but also ensures that this information is consistent; therefore, workers can more easily identify hazardous chemicals and understand how to appropriately handle, store, use, and dispose of these. Product identifier – indicates the name of the hazardous chemical and the proportion of each ingredient it contains. Signal word – states the severity of the hazard presented by the chemical: ‘Warning’ for less severe hazards and ‘Danger’ for severe hazards. Pictogram – a symbol designed to quickly communicate special information about the hazards of chemicals. The pictogram is a black symbol on a white background within a red diamond. Hazard statement – a short and straightforward message illustrates the nature of the hazard (e.g., “Fatal if swallowed”). Precautionary statement – explains how to store, handle, or use the chemical properly and/or how to respond in case of exposure. Contact information of Australian manufacturer or importer. Obtaining accurate information to include in the GHS label – As previously mentioned, there are six specific details required for each GHS label. 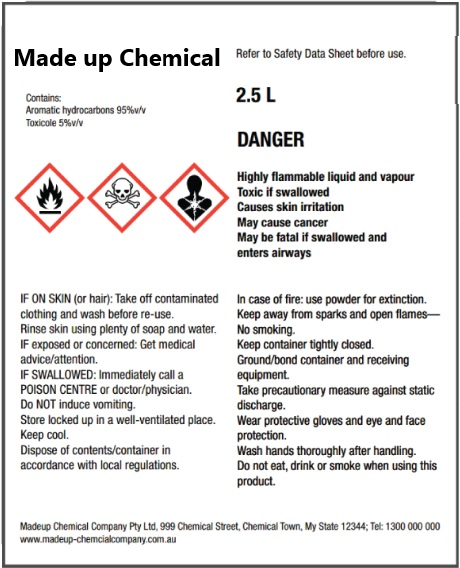 Searching for up-to-date safety data sheets, as well as the other required details, can prove challenging for some enterprises, especially since there are many who still don’t understand the labelling requirements set forth by GHS. Sourcing durable GHS labels – GHS labels must be able to withstand the harshest environments and chemicals. Ordinary office-grade labels easily peel, fade, crack or harden, and will fail compliance. GHS compliant labels should be able to resist grease, oil, solvents, degreasers, harsh cleansers, and disinfectants depending on their application and environment. They must also be resistant to abrasion, scuffing, tearing, and moisture. Getting appropriately-sized GHS labels – Containers for chemicals come in various sizes, from huge barrels to small spray bottles or even test vials. GHS labels must be able to fit these containers. 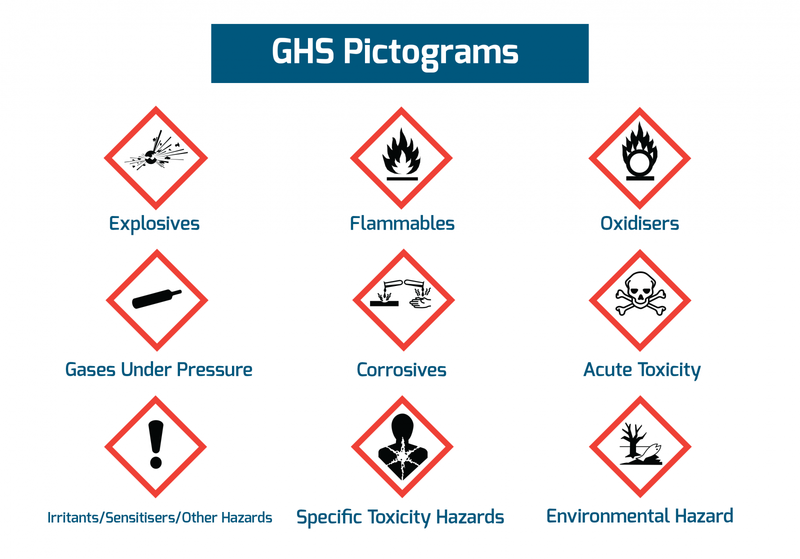 Finding GHS labels that adhere to different surfaces – Chemical containers come in different materials, such as metal, plastic, polycarbonate, glass, and more. For labels to pass muster, they must readily and effectively adhere to whatever surface they need to be applied. Keeping up with changes to labelling requirements – The fact is that labelling requirements for hazardous chemicals are subject to change, and companies big and small will constantly have to work towards complying with regulations. At Envirofluid, we envision a better world where toxic and hazardous chemicals are no longer commonplace and that is why we offer safer, high-performance chemicals to replace dangerous ones that put people at risk of instant injury or harm. Because Envirofluid products reduce health and safety risks, this translates to a decrease in your WHS and environmental compliance costs. Furthermore, our products can be used for a number of different applications, eliminating the need to store multiple toxic and dangerous chemicals for different purposes. Our chemicals not only drastically reduce health and safety risks in the workplace, as well as long-term illnesses caused by many common chemicals; they are also gentle on the planet, ensuring that we are leaving a better world for future generations.